So it's kinda weird now that the "secret" is out. Lots of lovely congratulations from online peeps :) But it's also been quite a strange thing to experience, the whole telling people thing. As I said previously, we weren't specifically NOT telling people, but we sorta just told them as it came up (oh, you're not drinking alcohol?) or was relevant (erm, you've scheduled me on work well into what will be my maternity leave). We told people as we saw / spoke with them and I have found the reactions very entertaining. I've never been the girl queuing to hold someone else's baby. Make no mistake, I have wanted my own kids my ENTIRE life. It has never even been a question for me. But other people's kids don't really interest me beyond "oh she's so cute" or whatever. You know, probably the very normal non-mom sort of reaction? But the already-moms. Wow, they squeal and clap and jump up and down. It's like I've just got membership at some club and they are thrilled to have a new member (victim? I dunno?). Perhaps this will be me in future? Right now tho, I find it very strange to see the difference :) And then there are the advice-givers who (surprisingly) fall into both the non-mom and already-mom groups. I find this so strange. Probably because no one has given me any advice yet where I've felt "Damn, I did not know this. This changes everything!". It's all stuff I have to explain (or just nod & smile thru) that I already know (ginger biscuits and dry crackers help with nausea / that hollow feeling), and am already doing (drinking lots of water) and have already made my own personal decisions about (if and when I'll be eating sushi). Actually being asked "how are you?" is also weird these days. Like people are waiting for me to tell them how awful it is so we can compare morning sickness stories ... I don't have anything exciting to tell. I don't feel 100% in the mornings but have avoided any actual vomiting so far. The thing I enjoy hearing least is when everyone else started their morning sickness ... especially when it's still in the future for me. Haha. It feels like a pokey witchy finger pointing at me saying "I'm still coming for you, my pretty". And then there are the people who want to shower you with all the things their kid no longer needs. I've had verbal offers of this, but have received nothing yet, so am unsure where I stand on this. It sounds helpful since there really is a lot you need for a kid. But I'm also getting offers for baby books (not books for babies, books about babies & being pregnant) ... what are people using baby books for these days? I have Google. In fact I have Google available pretty much 24/7 on my phone ... if anything weird happens that I'm unsure about or any sort of question pops into my head, I google it. Often right there and then. Speaking of Google, I had to use it the other morning, the day after the scan. I got this super weird feeling ... and didn't really know what to google exactly, but I found the answer I was looking for. See, much better than paging thru a book, hoping for the best ... And for my daily / weekly baby growing progress updates, I have the What to Expect website and app and emails. And then there are some fabulous blogs too ;) Really, who has time to read anything more? Aside from that I didn't really think I'd had any cravings yet ... except that I can't seem to go shopping on my own anymore - haha. But at the moment Green Apples are my go-to food. I know for a lot of people that's also a nausea thing, but I think for me it's the fresh crispness. We added apple pieces to our chicken salad the other night and then I made my first "weird concoction" for dinner the other night ... 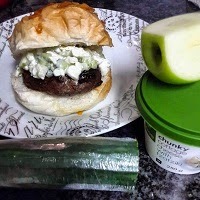 I had some Cottage Cheese with Tzatziki and I mixed in pieces of chopped cucumber and apple. And I had this "sauce" on my ostrich burger. Yeah, I think it qualifies - haha. The other thing I've noticed is "craving" (probably not really craving, more just simple thinking about and wanting) childhood comfort type foods ... white (best of both) toast with honey on. Yum. And when I was grocery shopping the other day, I came home with about a month's worth of dessert options (Lite custard and packets of Simply Delish jelly powder and soya chocolate desserts - so hopefully not completely terrible for us, haha!). Which is even weirder since I'd stopped wanting dessert after dinner for the couple of weeks before then. I think all of us already-Moms just like having someone who won't roll their eyes (politely) when we start going on about morning sickness/nappies/birth plans/baby-led weaning/sushi/insert whatever else you can think of here!